This years biggest event of premier racing raid for Asian off-road rider is held under the great sunshine of Pattaya beach in southern resort island in Thailand. It is encouraging for local that received devastating damage by Tsunami at Christmas time in 2004 in Phuket where is not far from here. It is bringing back all of the racers once again and revitalizing a local economy too. In result of confident vacationer come back here that filled with sun seeker from all over Europe throughout a winter. This year they brought top riders from own host country along with many fellow Asian participants from Japan, Korea, Taiwan, Malaysia. And Australia, Belgium, Scotland, England, France, Switzerland, and United States like all over from the Glove. Total of ninety riders from twelve countries are filled on the colorful list of entry list. Violent ray of sunshine in southern Asia has guaranteed on there shoulder thru out of the competition, it is promising for 62 of lucky podium finisher at the other side of the end. First day of competition of FIM sanctioned international off-road enduro ÒMAXXIS ASIA OPEN 2006Ó under goes in the beautiful blue sky of Southern Thailand. Resort paradise, Pattaya is a perfect place for kicking off. 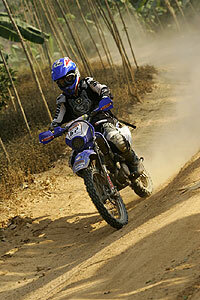 Rider #1 is belonging to this King of off road himself, legendary Mr. Manoch ABDUKAREE from a host country. Previously five wins under his glorious rŽsumŽ from 2000 thru 2005. He just missed collecting one tallest trophy at 2001. 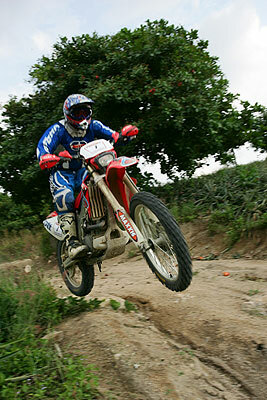 It almost seems like nobody can confronting him and his Honda CRF450. But a race is a race that what we here for!!! WeÕve come here to win!! WeÕll go for a fun! Let the race begin. First dayÕs route are tally of 128Km that contain two SS (Special Stage) for know who is a fastest. SS1 has 27Km of its distance and purposely design for running in for all level of entrants. At 18Km from starting point, there are serious going up hills and banzai dives, rough terrains are laid out for more troubles. These dry days of weather climate thru this event bring solid promises of faster and trouble free competition from the start to finish. Most of competitors are reached finish this SS safely. 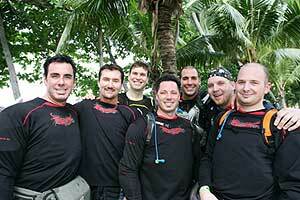 Next testament is SS2 for more prestigious FIM (UAM) class competitors. There is a true competition ride for serious contenders that real starting for racing. All of FIM(UAM) class riders tasting this challengeable character of routings are well blending into natural terrains in outland country. It has demanding coil winding trail, technique oriented climbing on steep wall and breathe taking down hill dive. Make long story shorts. At this day is over, prediction has never been breaking this time. 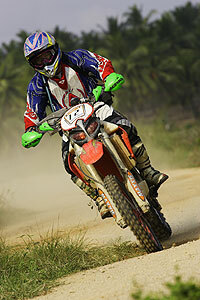 Its fastest crown goes to The Mr. Numero Uno, #1 Manoch ABDUKAREE (HONDA/CRF450). His steady and fast pace from moment of gate drops. 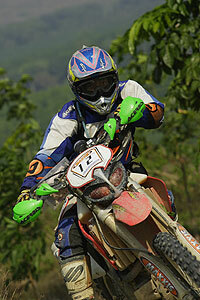 He manages to create mere three minutes advantage over closest finisher, fast Aussie #25 Mark ROSSI (KTM/EXC525). 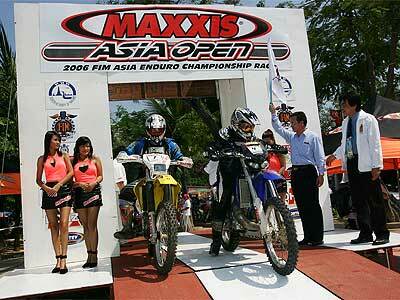 MAXXIS ASIA OPEN 2006 is under goes for prediction against expectation. Day one was in history. History is always cruel for optimist. 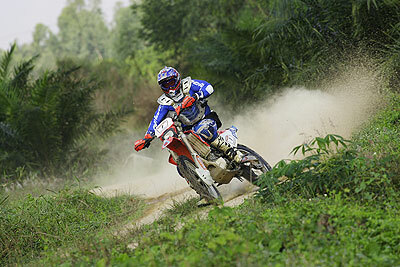 They consumed 23 of non survivor riders from a first day specially its SS2 run. Rests of 77 gallants are throwing dirt behind to spectatorÕs face at hotel courtyard that looks hurry fading into the other blue sky day that twined with hot and very humid day in the country side of beautiful scenery of Thailand. First menu of a day is SS3 for FIM(UAM), SS2 for SPORT class (SC) that have a length of 25Km goes inside boundary of rubber plantation farms. 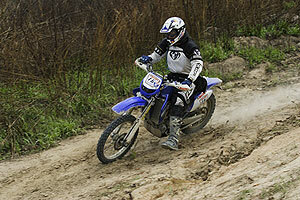 Riders must continuously negotiate with challenging ups and down that almost never reach to end forever. Mr. Perfect himself, #1 Manoch ABDUKEREE (HONDA/CRF450) is once again a top of a podium at this SS3 with 23 minutes flat on our official clock. But this time, in the close and striking distance, Dark horse #25 Mark ROSSI (KTM/EXC525) is managed in just 71 second of separation between them. After this SS3/2, all of finishers have enjoyed short break of lunch with endless fruits after fruits at MAXXIS INTERNATINAL THAILAND facility. These riders must going back to reality for up coming longest and toughest SS4 for FIM (UAM), SS3 for SC in the afternoon exercise. This 75 Km of SS are two element of competition. First one is rubber and pineapple plantation farm landscapeÕs has natural geography of ups and downs provide true competitive routing. In addition to this, it has ill handling sand sections, tire beating rocky terrains and really rough road are waiting for all of riders who try to run thru. Second one is a simply typical afternoon heat wave and drenching humidity in the winter of Southern Asia. Once again, the winner goes to as you guessed it, #1 Manoch ABDUKAREE (HONDA/CRF450) with time of one hour ten minutes twenty three seconds. Second place finisher Scot, Stephan KEOGH (YAMAHA/YZR250R) and third place #25 Mark ROSSI (KTM/EXC525) both has huge debit of six minutes from #1 Manock ABDUKAREE (HONDA/CRF450). Later in this event goes further down, this single result became a decisive factor of winning the race that no one will knows yet in this moment. At the finishing point of this SS, one of Japanese FIM(UAM) class entrant #6 Yukiyoshi TAKETANI (HONDA/XR250) that also most elderly in all competitor was finished at 18th place says, ÒIt is one of the toughest run we must manage to finish home first. Grooves are really deep and highly focused concentrations are two key issues at any single secondÓ. Many of entrants from outside like came from Korea and United States, and even from host country riders are taking an easy to avoid heat exhaustion also physical demanding of tough riding. In result of being too easy, Òtime overÓ has been applied for many of finishers. Overall result indicates few good mans are selected, that announcing elimination round are just finished. Second half of second day of competition is third SS of a day (How busy day is this day!!). SS5 for FIM (UAM), SS4 for SC. Tight sections, lots of up and down hills that lays on 25Km of run inside of rubber plantation farm required top notch performance by already exhaust riders and there wounded vehicles till they found a finishing point of this SS5/4. Testament has delivered. Only selected top seventy riders are allowed to start this SS5/4. Then testament is giving spot light on comeback kid, #25 Mark ROSSI (KTM/EXC525). First time of this meeting, he scores a fastest time! (16 min. and 54 sec.) that ahead of #1 Manoch ABDUKAREE (HONDA/CRF450) for 20 seconds. This time, time is his. Well done, Mark!!. At end of this endure day, night falls on hotel court yard that becoming really everybodyÕs resting place for both riders and their machines. Crews are preparing and wrenching in the around a clock until tomorrowÕs starting time. 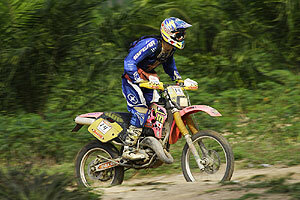 Third morning of MAXXIS ASIA OPEN 2006 is sending out its start line with 67 of remaining and surviving riders. Cold reality takes another ten of riders off to the side line by previous dayÕs resulting board. Some of riders are may look back in the future, MAXXIS ASIA OPEN 2006 was a one of toughest year in the history of this events. It is a longest transition runs between three SS shoot outs that required total of 222Km of it in third day. SS6 for FIM (UAM), SS5 for SC, and 17 Km of short run is zapping thru rubber and pineapple plantation farms. 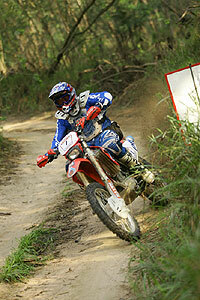 Once again, as you bet it, #1 Manock ABDUKAREE (HONDA/CRF450) is fastest of all for time of 16 minutes and 04 seconds. His never laid back attitude toward to goal is something to already promise for himself, who taking another big one for his fireplace. Following by SS7 for FIM (UAM), SS6 for SC, is a mirror copy of SS5 routing only difference is starting from its finish point of previous one. 25 Km of familiar ups and downs routing brings good news for #25 Mark ROSSI (KTM/EXC525) who scored time of 15 minutes and 54 seconds. 14 seconds of separation means to him, fight is not over until itÕs over for not only himself but only second finisher #1 Manoch ABDUKAREE (HONDA/CRF450) which slightly behind Aussie this time. These kind of tight sections are really advantage on this KTM rider. Another notable is #16 Cortny SMITH (YAMAHA/WR426) is coming back from exhaustion, bringing back own game and solid strong run awarded him for 5th fastest time of 17 minutes and 22 seconds. Last SS of a day is reverse run of SS1 in the LEG1 as LEG3Õs SS8 for FIM (UAM), SS7 for SC, As easy as SS1 this 27 km short run is also suitable for every competitor. Once again familiar name is coming back on top of the mountain #1 Manoch ABDUKAREE (HONDA/CRF450) with 29 minutes and 08 seconds as fastest time. 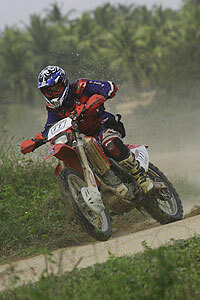 Second fastest finisher #11 Pattapong PRADUPYART (HONDA/CRF250R) from Thailand is just 45 seconds behinds. His heroic comeback from career ending accident at three years ago from top shape while national supercross champion title under his arm at time. He carefully chose last season was a rehabilitation period for him to coming back in racing speed. So it is time now for him to show its tarrent and smooth riding style in full speed. Highly anticipate public attention is expected once again. At the end of the day result board, #1 Manoch ABDUKAREE (HONDA/CRF450) has little shay of 14 minutes advantage over anyone who challenge to turn around this deficit on its final day of competition. He almost senses for very sweet taste of Champaign that will be his sixth. 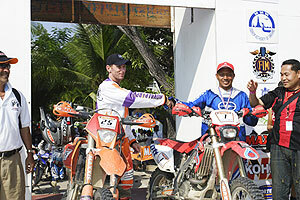 Decisive day of MAXIS ASIA OPEN 2006 has only two of last SS left for #1 Manoch ABDUKAREE (HONDA/CRF450) could/should cruise to finish line. Previous three days of competitions were he concluded by perfectly executed riding and far from troubles on his machine almost make them invincible to catch. In the mean time, fellow competitors who expecting for something extraordinary things happen to both them and Mr. Perfect. Time is now, not tomorrow, not later, they must run like a mad dog to make miracle possible. Deference between one man and rest of pack is only 14 minutes big one! Another picture perfect blue sky is cast member for this final episode of drama. 62 fast rider are lining up at staring point that five less riders than yesterday morning. Already experienced SS4 is designed for them in reverse routing that is a todayÕs first SS9 for FIM, SS8 for SC, as of 75 Km run. Flush memory of this route thru farms and rough sections are even tougher terrains for all contenders, one luxury we have a less sunshine on there shoulder in cooler environment for easier riding than day twoÕs hot run. This ideal condition helps most of survived riders be able to made its goal on this SS. The Boss did it again as a king of kings #1 Manoch ABDUKAREE (HONDA/CRF450) by finishing first at one hour nine minutes nineteen seconds on his scoring clock. Second place belongs to #25 Mark ROSSI (KTM/EXC525) has 21 seconds more time to complete for same routing. Third and fourth place are another three minutes behind him. Fifth place is big nine minutes back. 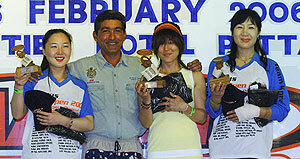 #62 Ms. Eiko SUZUKI (YAMAHA/TT-R125LM) from Japan is best female finisher at this moment scored at 35th place overall. She has a special training method for this hostile humidity condition to suit physical demand for competition. Before she comes to Thailand for MAXXIS ASIA OPEN 2006 who made frequent visits to hot steam bathing were certainly paid off with this result. Final SS10 for FIM (UAM), SS9 for SC, is short 25Km run for reverse order of SS3 in LEG2 that almost congratulating #1 Manoch ABDUKAREE (HONDA/ CRF450) for final shortest time to finish. He could conclude competition at almost perfect score. This time his wing man is #11 Pattapong PRADUPYART (KTM/EXC525) for one minute of respect. 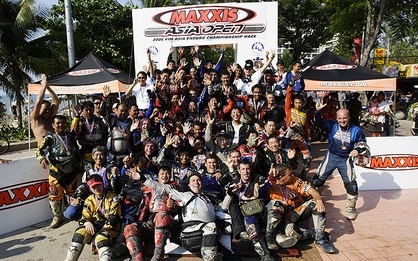 At the finishing point of MAXXIS ASIA OPEN 2006 has filled by smiles and fun chatting each others and congratulates fellow completions who riding thru this tough conditions. All competitors and crews are waiting for transition convoy to be leaving for hotel in Pattaya beach once last finisher has been reached this final point of end. Flying local hero Mr. ABDUKAREE is once again at top of podium with the best smile in these four days. It is his sixth, the history has been written now. Big finisher is followed by a big night, ceremonial party has just begun for all of participants, entrants, sponsors, media and officials are enjoying relentlessly no other place to better to celebrate MAXXIS ASIA OPEN 2006 for never ending night in the beautiful Thailand. Local dancers appear to present traditional dance, entrants have picture taking moment, finisher medal has been presented, and spectators are flood all over into party lounge. Ladies and gentlemen! ItÕs a party time! !